In the past, whenever I have viewed a Gauntlet game, found in the "Hall of Fame" section of the forum at CivFanatics, where the rules allow the player to select the civilization to play as, I have wondered about the little sign stating "Must not play as Inca". 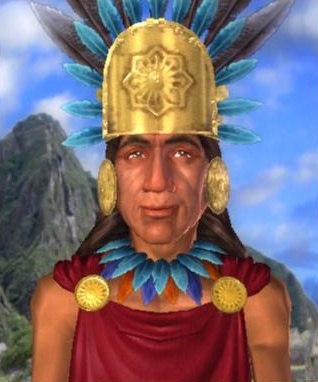 So I asked myself: "What about this smiling man with golden earmuffs could be frightening enough to ban the whole of the Inca civilization for competition purposes?" Is he a homicidal maniac? No, that position is taken by the insanely murderous and psychotic Montezuma of the Aztec. He'll turn on you and try to drag you to the sacrificial altar if you so much as peer quizzically at his odd-looking hat. Does he have Super Powers? Not that I can see. Huayna Capacs' Traits are Financial, which give him an extra commerce in any square where at least 2 commerce is being produced, and Industrious, which increases his wonder production by 50% and allows him to build Forges twice as fast as normal. It's a good combination, but it doesn't seem over-powered to me. Sure, it allows for a high research rate to get to the wonders, and then an advantage in getting them, but wonders are not an instant "I Win"-button. What about his people then? Do they employ the sacrificial altar like the Aztec? No, the unique building for the Inca is the Terrace, a modified Granary which provides an extra +2 culture per turn. That doesn't seem very over-powered to me. Sure, it's useful for a Cultural victory or for strengthening your cultural borders or even as an alternative to building a monument, but it won't win the game for you. Furthermore there is no synergy with the wonders apart from the added culture if you go for a Cultural victory. So what's left? Could it be their Unique Unit? Ah, now we're getting somewhere. Could their Unique Unit be a blood thirsty monster? Let's take a look at what's called the Quechua. Historically this unit is fictitious: Quechua is the name of the language of the Inca and so the usage here might at best allude to the unit being a "Quechuan soldier". The equipment the soldier is carrying is somewhat more realistic as the Inca knew how to mix tin and copper to make bronze and were known to use shields covered in leather for defence. In the game the Quechua replaces the common Warrior and is thus the first unit the Incas can build. On top of the normal stats of a Warrior the Quechua is granted the promotion Combat I, which gives a 10% boost to it's damage output, as well as an extra 100% vs. Archery units. This is, apparently, what makes the Incas dangerous enough to ban. Remember the earlier premises? The civilization is banned in Hall of Fame games, which are played against computer players at high difficulties. A known fact is that computer players start with Archers instead of Warriors at higher difficulties. Adding it up these individual pieces, the bonus of the Quechua, the fact that computer players start with Archers and the immediate availability of said Quechua, we have in front of us a picture, nay, a billboard, shouting at us: GO ON, RUSH THEM!!! In order to successfully capture an enemy city using Quechuas you need only two units per defending Archer plus one in reserve in case you are unlucky. The probability of victory against an unpromoted Archer defending a city is at worst (City with cultural defence at level 2 giving +40% defence, 25% fortify bonus and on a hill giving an extra 50%) 36.8% for an attacking unpromoted Quechua. As the archer is virtually guaranteed to be injured during this fight a following attacker will have a considerably higher probability of success. As about a third of the initial attacks will be successful, on average, the need for the Quechuas to travel in teams of two decreases as the number of defenders increases. Still, it is prudent to use the "2 attackers per Archer plus 1" approach as it is virtually guaranteed to win. Eliminating close-by enemies and stealing their capitals, which are generally placed in rich areas, will give the player at the very least a powerful start, if it doesn't win the game outright. Of course, this wouldn't work in multiplayer. First of all, a normal player wouldn't start with archers as defenders effectively turning the Quechua into a 10% stronger Warrior. 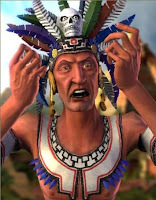 As Warriors have +25% bonus when defending a city the Quechua rush looses its bite. Factor in that a competitor might research a stronger attack unit such as the Axeman (if they have a source of copper), the Chariot (if they have access to horses) or even the Spearman (without a requirement) and the situation could be quickly turned in their favour. This can happen in a game against computer controlled players as well if the distance between the starting positions is too great or if the players start on isolated islands. Given enough time the computer players will produce their own Axemen and become impervious to Quechuas. Finding out the (not so) hidden qualities of the Man with the Yellow Hat and his collection of Curious Quechuas gives us another tool to use when we feel like lowering the difficulty level a bit. The Quechua Rush can be used to devastating effect if the enemy is using Archers to defend, but will meet with disaster if the other player is a human, left alone for long enough or in a completely different part of the world. If anyone is interested in a further explanation of the mathematics behind the combat figures, please make a comment and I'll make a post about that as well.